Purchase online PTP-II Bluetooth Thermal Printer in India at low price from DNA Technology, Nashik. This is a Portable Compact Re-chargeable Bluetooth Thermal Printer making it perfect for portable and retail applications where wireless printing is required. Thermal Printing is a type of digital printing process in which no ink is required an image or text is printed on a special Thermal Paper by heating the paper by passing it over the Thermal print head. 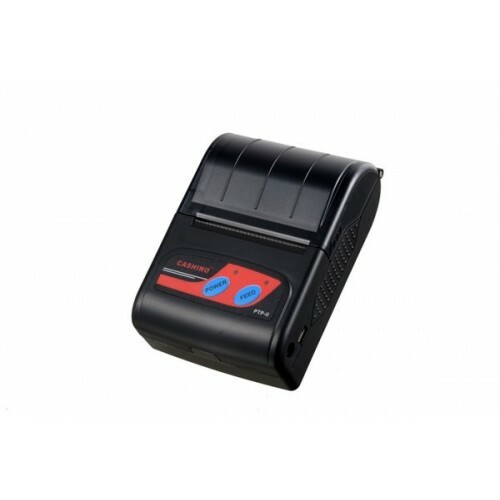 This is a 2 inches (58 mm) Bluetooth Thermal Printer and is compatible with Android Mobiles as well as it can be connected to your PC/Laptop via USB Port. It has a removable & rechargeable 2000 mah lithium battery which can work for eight hours once it is fully charged. This is a very easy to use printer and can easily work with any Bluetooth Printer app that is available on Google Play Store making it very easy to use. Also we were also able to print using Arduino as well as Raspberry Pi similarly you can also connect it to any micro-controller (via Bluetooth) that you want so you can easily integrate it with your embedded system. We can provide the necessary technical support for integrating the Bluetooth Thermal printer with your micro-controller or Raspberry Pi. High printing speed , up to 80mm/s. Standard accessories: Long-term preservable paper, AC adapter, li-ion battery, USB cable,leather coat ? PC42t Barcode PrinterThe PC42t Desktop Barcode Printer from Honeywell sets new standards for user-fr..